Ever since I attended my first Season Kick Off party at the 300 Bowl on Cass Lake, I’ve been hooked. The year was 1995, as I descended the stairs to the small banquet room, it was like Christmas morning. There were helmets, jackets, gallons of oil, gloves, everything. The camaraderie was great, but oh those prizes. In those days, the board solicited prizes and even purchased a few from area dealerships like Jan’s, Harp’s, LaBarons and Andersons. I remember being impressed that a few would work so hard to make for a fun filled evening for so many. I promised that if I ever got involved, I would do everything within my power to insure that every member would have the opportunity to have this experience. It’s now 2012. The world has evolved. The a fore mentioned dealerships are gone. Replaced by online stores. Nowadays, we click a mouse, add to cart, select pay pal and shopping complete. Maybe that’s why the Novi Show still sets records for attendance. You can touch those bibs, try on those boots. You can see and analyze the latest technology. But most important to me, is the interaction with the people. For one weekend a year we get to talk snowmobiling face to face with human beings as passionate as we are about this sport. From the attendees to the vendors, there is no better place to promote the SnomadS. Due to a long standing tradition of teaching a Safety Class at the show, initiated by Chuck Ham, our Club maintains a highly visible presence at the show. We are known throughout the snowmobile community as an organization that gives back through our Safety Education and charitable actions.This enables us to approach vendors at the show and solicit donated items to raffle off at the Kick Off party. This year, the FWO collection committee had personal issues arise, that created a need for others to step in and help. And help they did. John Newman, Merle, Julie and Kirk Fitch, Sally Whitaker, Marlene and Keith Kish, Marian Schroeder and I volunteered to shake them down. John and the Fitch’s greased the wheels beginning Saturday. By Sunday, we spread out and reaped the fruits of their labor. The vendors gave like they haven’t in a long time. In addition, several members procured donations or made donations as well, most notably, Marty Foster, Greg Whitaker and Dennis Weber. Fast forward one week to Nov. 10th and Santia Hall. We all arrived to help Dave Gabriel set up the hall. Everyone pitched in and worked like a well-oiled machine. We had an amazing 5 tables full of very nice prizes. Now we had to hope the membership would show up to support our efforts. Well, show up they did. 86 to be exact. We ran out of tables to eat on and had to use the registration tables well. After and empty chair ceremony by Chuck Comstock, to honor the passing of our First Lady Connie Duke, we began the evening’s festivities. Gino and Irene prepared a great meal for us. The Ride Coordinators presented their rides. Dennis Winowiecki, Bonnie Mooney and Scott Boal were given certificates recognizing their 20 years as members. 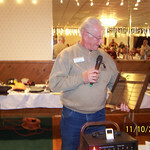 Our Webmaster/Secretary Marty Foster was awarded Volunteer of the Year. The Snomad of the Year went to a well-deserved Ray Williams, only 1 of 3 people to receive this award twice. However, the big winner of the night was the Easter Seals of Michigan and our FWO riders. In spite of a sluggish economy, your auction and raffle prize donations amounted to a record $2156.00! Truly amazing! Something special like this doesn’t happen by accident. To put on an event this successful requires a lot of planning and hope that all goes as planned. There is no way to thank everyone individually for their efforts in the space provided. So let me just say this. Thank you to the Volunteers, the workers, the Committees, The Board of Directors and especially to you the membership. 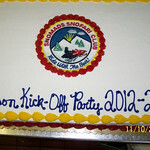 As an organization, we are the sum total of all of our parts and you should all be proud to part of the SnomadS family. I feel that we have kicked the 2012/2013 season off in grand fashion. So now, may we receive the snow we deserve, the health to enjoy it and grace to be thankful for both.